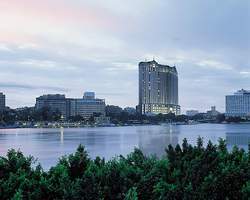 Four Seasons Hotel Cairo at Nile Plaza, Cairo International Airport (CAI): Approximate driving time is 45 minutes and distance is 30 kilometres (18.5 miles). The 365 guest rooms, including 77 suites, are generously sized and reflect the vibrancy of contemporary Cairo, with bright interiors, natural wood finishes and chic, comfortable furnishings. All guest quarters offer panoramic views, whether across the Nile to the island of Zamalek and beyond, or towards the 12th-century Citadel. Triple-glazed windows ensure that interiors remain cool and quiet. Well-defined work areas allow guests to remain productive. Up-to-the-minute technology for communication and entertainment includes high-speed Internet wired and wireless access throughout. The spacious marble bathrooms incorporate Four Seasons signature features: deep soaking tub, separate glass-enclosed shower, large double vanity and, in a separate alcove, WC with telephone. Overlooking the Nile and the island of Zamalek, Four Seasons Executive Suites are perfect for longer business or leisure stays. They ensure privacy for casual entertaining or informal meetings by separating the living area from the bedroom with a pair or doors. Also featured are two private terraces. Four Seasons Executive Suites feature a king bed or two twin beds, large dressing area, separate sitting area with a double sofabed, entertainment centre with TV and DVD, multi-line telephones, in-room safe and a well-defined work area with high-speed Internet access. Two private teak-furnished terraces measuring approximately 12 square metres (129 square feet) overlook the Nile and the island of Zamalek. The spacious marble bathroom features a deep soaking tub, separate glass-enclosed shower, large double vanity and separate WC with bidet. Offering views of the Nile and the island of Zamalek from the 7th to 30th floors of the Hotel, Premier Nile Rooms feature a large working or lounging area, making them ideal for longer stays. Premier Nile Rooms feature a double sofabed, entertainment centre with TV and DVD, multi-line telephones, in-room safe, a well-defined working area and high-speed Internet access. The marble bathroom includes a deep soaking tub, separate glass-enclosed shower, large double vanity and separate WC with bidet. Nile View Rooms offer ample space for work or relaxation, against exotic backdrop of the Nile or Zamalek Island. These rooms feature a private outdoor terrace which may be used for dining. Nile View Rooms feature an entertainment centre with TV and DVD, multi-line telephones, in-room safe, a well-defined working area and high-speed wired and wireless Internet access. With ample space for work or relaxation, Deluxe Rooms offer views of the pool and Citadel. Each room also features a private terrace. Deluxe Rooms feature an entertainment centre with TV and DVD, multi-line telephones, in-room safe, a well-defined working area and high-speed Internet access. Situated throughout the Hotel, Superior Rooms are generously sized and offer views of the pool and Citadel. Superior Rooms feature an entertainment centre with TV and DVD, multi-line telephones, in-room safe, a well-defined working area and high-speed Internet access. Standard Rooms, located on the sixth to eighth floors of the Hotel, offer comfort and style with views of the Citadel and the pool; some feature a private terrace. Standard Rooms feature an entertainment centre with TV and DVD, multi-line telephones, in-room safe, a well-defined working area and high-speed Internet access. Two elegant and spacious Royal Suites crown the Nile Plaza tower. These luxurious, three-bedroom enclaves on the Hotel's highest floors present bird's-eye views of the Nile and distant Pyramids. Royal Suites feature a separate foyer with reception desk, which leads to an extensive living area, a separate dining room with seating for 10, an adjoining pantry with direct corridor access and an executive study. They include a double sofabed, an entertainment centre with TV and DVD, multi-line telephones, in-room safe and high-speed Internet access. They offer two private teak-furnished terraces, which together provide an additional 40 square metres (430 square feet) of relaxing and entertaining space. The two king-bedded rooms and one twin-bedded room boast separate dressing areas and walk-in closets. The three spacious marble bathrooms each feature a deep soaking tub, separate glass-enclosed shower, large double vanity and separate WC with bidet; a guest powder room is located off the living area. With views of the Nile from their private terraces, the elegant Presidential Suites are perfect for working, relaxing and entertaining. These sumptuous suites, located on the 25th to 28th floors of the Hotel, feature a large living room and a separate pantry with direct corridor access, facilitating unobtrusive catering for dinner or entertaining. Presidential Suites feature a double sofabed, a separate pantry, an entertainment centre with TV and DVD, multi-line telephones, an in-room safe and well-defined work area with high-speed Internet access. They include two private teak-furnished terraces, which together offer an additional 34 square metres (366 square feet) of relaxing and entertaining space. Two king bedrooms boast separate dressing areas and a pair of doors to separate each of the bedrooms from the living area. The marble bathrooms each feature a deep soaking tub, separate glass-enclosed shower, large double vanity and separate WC with bidet. Overlooking the Nile and the city from a large private terrace, Diplomatic Suites are perfect for guests whose accommodations must serve as both an office and a home away from home. They offer extra-large living spaces and the privacy of a separate powder room. Diplomatic Suites feature a double sofabed, an entertainment centre with TV and DVD, multi-line telephones, an in-room safe and a well-defined work area with high-speed Internet access. They include a large private teak-furnished terrace measuring approximately 12 square metres (129 square feet). The king bedroom boasts a separate dressing area with a walk-in closet and is separated from the living area by a pair of doors. The spacious marble bathroom features a deep soaking tub, separate glass-enclosed shower, large double vanity and separate WC with bidet; a guest powder room is located off the living area. Overlooking the Nile, these suites are perfect for longer business or leisure stays. They ensure privacy for casual entertaining or informal meetings by separating the living area from the bedroom with a pair or doors. Also featured are two private terraces for relaxing and dining. Nile Suites feature a king bed, large dressing area, separate sitting area with a double sofabed, entertainment centre with TV and DVD, multi-line telephones, in-room safe and a well-defined work area with high-speed Internet access. Two private teak-furnished terraces measuring approximately 18 square metres (194 square feet) overlook the Nile. Spacious Corniche Suites are located on the 6th to 30th floors of the Hotel and offer views of the Nile and the island of Zamalek. These suites feature a large working or lounging area separated from the bedroom by a pair of sliding doors. Corniche Suites have a sitting area with a double sofabed, an entertainment centre with TV and DVD, multi-line telephones, an in-room safe and a well-defined work area with high-speed Internet access. The spacious marble bathroom offers a deep soaking tub, separate glass-enclosed shower, large double vanity and separate WC with bidet. A little Italy in the heart of Cairo, Bella offers the specialties of Italy in an inviting, familial setting with direct views overlooking the Nile. Two wood-burning stoves on either side of the restaurant’s open kitchen produce fresh, authentic Italian loaves, including focaccia and sciattata. Seats 80. Fresh pastas - squid ink, beetroot and spinach to name a few - risottos, meat and fish selections. Evenings feature a traditional antipasti buffet. A casual dining experience where spectacular food and outstanding service are second to none. Steaks features premium cuts of beef, combined with rustic-style décor, including rich woods and leathers, and original sepia photographs of rural Egyptian settings. Specialising in the best cuts of local and imported beef, the menu offers a choice of steaks cooked to perfection, complemented by a wide range of accompaniments, including salads and creative vegetable dishes. Tuesday evenings feature a steak and sushi buffet. Overlooking the Nile, Spice presents China’s celebrated Cantonese cuisine. The restaurant’s modern Asian design creates an elegant dining atmosphere, with fluid, circular patterns of varied shades of wood. Two private dining rooms can each accommodate 8 guests for intimate gatherings, while the open seating area offers a captain’s table for a larger group of 10. Authentic Cantonese fare is freshly prepared using local ingredients. Seats 88. A variety of traditional steamed and fried dim sum, and featuring a special dim sum buffet served on Fridays. Aqua offers stylish dining overlooking the Nile. A stunning entrance flanked by two custom-made aquariums containing exotic, brightly coloured fish leads to a sleek black stone interior. The menu offers a light, refreshing take on authentic French cuisine, with an emphasis on seafood. An extensive French wine selection and Grand Cru are also available. For large parties, Aqua has an adjoining bar area suitable for champagne and cocktail receptions, as well as two private dining rooms with seating for up to 12 guests. From 8:30 pm to 9:30 pm on Saturday, March 28, 2009, be part of an exciting gourmet Earth Hour experience at Aqua Restaurant and join 35 other Four Seasons properties in creating a chain of candlelight dinners around the world. Authentic Lebanese flavours come alive in Zitouni, 24 hours a day. An extensive buffet display situated in front of the restaurant's open kitchen offers breakfast, lunch and dinner. Guests enjoy premier views of the Nile from large picture windows. Secluded alcoves, featuring contemporary wood décor, provide a more intimate dining alternative. Seats 116. Guests enjoy a wide range of authentic Lebanese specialties such as breads, mezzes and grilled dishes, prepared by a team of gourmet Lebanese chefs. With shaded seating beside the Hotel’s three outdoor swimming pools and convenient access to the Spa and Wellness Centre, the Pool Grill offers an informal and convenient setting to enjoy simple, tasty fare. Seats 58. The Pool Grill serves a light, refreshing Continental breakfast. For lunch and dinner grilled fish and meat, and a wide selection of Oriental mezze, satisfy swimmers' appetites throughout the day. Don’t miss out on our Shisha Corner where you can savour the latest water pipe flavours while sipping away on a Moroccan tea or Arabic coffee. A rendezvous point for Cairo's chic and trendy crowd, the Beymen Café offers a light, modern take on classic cuisine. A stunning stained-glass ceiling and vibrant colours create a lively, energetic atmosphere, while intimate seating offers the chance for sparkling conversation. Choose from a selection of pastries, salads, petits pains and desserts, or visit the sushi counter for fresh sashimi, sushi and maki. Bathed in sunlight and surrounded by lush foliage, this tropical oasis on the upper pool deck enjoys an airy ambience overlooking the Hotel's three pools. Guests can retreat to comfortable settees arranged around eight 107-centimetre (42-inch) plasma screen televisions, or enjoy nightly live guitar and DJ performances. In addition to Moroccan and pool dining menus, Shisha Lounge offers extensive selections of creative mocktails and shisha flavours. Seats 40. Located on the fourth floor of the Hotel, the Business Centre, together with the multilingual Concierge services, provide comprehensive business services and support. Computers, printers, a scanner, high-speed Internet access and a wide range of secretarial and translations services are available with advanced booking. Open daily, the expansive 24-hour health club has a striking, contemporary ambience with stunning views of the Nile from its floor-to-ceiling windows. Part of the Spa and Wellness Centre, it is the largest facility of its kind in Cairo, and offers state-of-the-art equipment, certified trainers and fitness assessment counsellors to help guests get the most out of their workout. The gym is divisible in two to provide a secluded, private workout space upon request. Within a secluded rooftop setting, an extensive outdoor terrace nestles between the Hotel and an adjacent residential tower. Surrounded by lush landscaping, shaded alcoves, cabanas and umbrellas, the terrace's three heated pools offer a calm respite from the city. Seventeen poolside cabanas – available on a daily basis – each offer a large terrace, a private shaded sitting area and their own individual showers and WCs. Guests may enjoy a dip in the free-form swimming pool, or an aquatic workout in the lap pool, before relaxing in the adjacent whirlpool. A children's play pool is nearby for the exclusive use of children from 4 to 12 years of age. A heated indoor pool is located within the Spa and Wellness Centre for guests 16 years and older. The Spa offers a comprehensive range of massages and all-natural spa treatments designed to meet the personal needs of each guest, promoting relaxation, invigoration and renewal. The largest of its kind in the city, the Spa offers 15 treatment rooms including a couple's treatment room, sauna, steam room, whirlpool, cold plunge and a serene relaxation area. The Spa also features an indoor swimming pool. Beverages and light snacks are served on the adjoining pool terrace. The Gezireh Sporting Club is a five-minute drive from the Hotel. The largest multi-purpose sporting club in Egypt, it offers 20 clay courts that are lit for night play.